The latest in the infographic series from Thomas Cook. What do you think? This entry was posted in Fun things and tagged Fun, Infographic on January 25, 2012 by Adrian Land. As SEO is truly evolving as a holistic web channel (always treated it like that for >10 years anyway) who progress the web, police our employers efforts, drive internal innovation and do the bulk of testing! SEO is officially moving beyond just the few things that we did in 1999 to 2009. Just a few of the things we do / did / continually getting better at: usability, analytics, technical best practice, IA, server configs, indexation, project management, data crunching, linguistics, semantics, keywords, sociology, feeds, futurology, marketing, coding, explaining, monitoring, testing, learning and refining. And a million other things that I have temporarily forgotten. If you think that anything that appears on the first page of Google is in scope. And as more verticals get added into the universal/blended SERPs, people are using phones/tablets/TVs and a growing number of devices that haven’t been invented yet to access the web and the internet. Then, if you blend in the idea of every increasing personalisation, we, the SEO community need to keep evolving ourselves, innovating, learning, changing and keep delighting our audiences. Therefore in 2012, Social, Local and Mobile are firmly in scope. And we, SEOs, love an acronym or even making up a term or 2. So, SoLoMo, might be my new catch phrase for 2012. This entry was posted in Opinion and tagged Opinion on January 15, 2012 by Adrian Land. SOPA/PIPA – is the slippery slope coming? The slippery slope might be coming. I tweeted about this last week, but I came across some more articles while surfing around tonight, and thought I would share a few things. I am actually scared that if this PIPA/SOPA law gets passed in the US, then other countries might follow suit. In recent years in the name of terrorism, political dissent, civil unrest and through general fear, governments, even the fairly liberal UK have passed laws that have the potential to really cut down on freedoms and innovations. Check out this video for an explaination from the Fight for the future site. You should also take a read of Stop American censorship site as they explain the details. I found this site after seeing an out of character post on the WordPress blog. If this goes through and if it is then used, a small series of events could actually fundamentally change how our future should be developing, stifle industry, communication and innovation. This is scary and could be the beginning of the end. Here is their infographic which explains a few of the details as a final thought. This entry was posted in Opinion on January 14, 2012 by Adrian Land. An oldie, but a goodie. Found this optical illusion on an old CDR that I was about to bin. Your eyes are making it move. To test this, stare at one spot for a couple seconds and everything will stop moving. Or look at the black centre of each circle and it will stop moving. But move your eyes to the next black center and the previous will move after you take your eyes away from it…. Weird hey. And strangley depending on your eyes it bleeds out over the right hand nav! This entry was posted in Fun things and tagged Fun, Optical illusion on January 9, 2012 by Adrian Land. Server Response Codes – what are they & why are they important? When you request a URL or an element within a page, your browser you send a request. The magic of the tinter-web happens and the server you end up on sends back the content, with a response code, that communicates with your computer and confirms success/failure or an alternative action suggestion. To really know what your servers are doing I really would suggest that you monitor your server response codes. This is especially important during any migrations/ launches or major changes. You can get this data easily inside Google Webmaster Tools or any internal tools you may have e.g. Tealeaf. If you are doing testing you can even get browser plugins e.g. http headers, or, fidler for Firefox. Monitoring server response codes gives you insight into your site health, indexation, what is really happening, advanced usability monitoring, especially if you look by useragent or at a session level. It all depends on what you wanted your site to do. I jokingly say that reading repsonse codes are a bit like ‘tarot cards’ as you need to add context to when the code was given. You will see some common definations below. 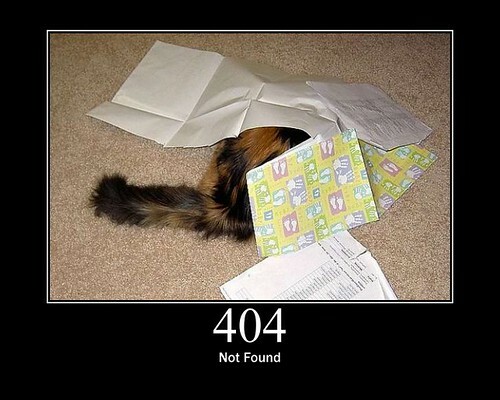 So, if you mean to give a 404 to delete a page from Google, then it is a positive thing. However, if you have accidentally deleted or moved a page, then its bad. So, What are the most commons response codes I should know about? These codes indicate success. As in, you requested and you received. The request was fulfilled as requested. This is the ideal answer to most requests made. And if you see redirects e.g. a 301, at the end of the chain you should get a 200. This should following a POST command. POST means that you send a request and the content is then generated, then returned. As opposed to a GET command, which ‘gets’ the same page every time! In the old days, POST was to get search results and GETs were ‘static’ pages. These days, you can have a GET URL, but actually POST to get the content. More to come in real HTML5 as we object. These codes handle redirections of permanent or temporary in nature. The data requested has been assigned a new URL, and the change is permanent. This is the most common type of redirect for any kind of content movements, site migrations or major platform upgrades (effectively an internal migration). A user may notice a different URL in their browser. But for a SEBot, this means replace the URL you requested with this new one. The data requested actually resides under a different URL temporarily. A user will not likely notice, and the instruction to a SEBot is to look at the new location, but to keep the original URL in its db. The request had bad syntax or was inherently impossible to be fulfilled. The request is for something forbidden. You may see this if you are looking around a server and the sys admin has put permissions/access rules. Or an internal request has not be given the right level to authentication. A commonly used terms across the business, but do they know what it means? In short, the server has not found anything matching the URL requested. This could be a problem if you are not expecting this response code, or could be great if you have deleted a page and you want the search engines to remove this page from its index. You should ensure that the content of that page works for the user! Ideally a sign-post-page. 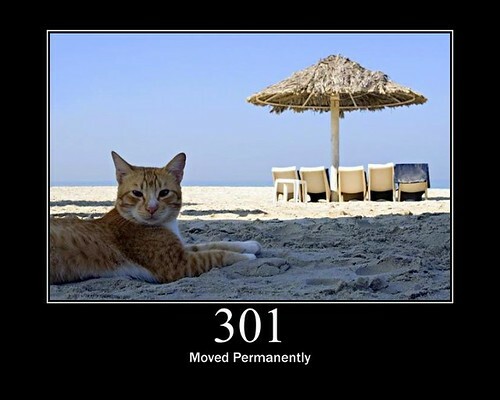 But a common mistake when creating a “404 page”, especially if you are use your app layer to resolve the request that it treats it like a disambiguation request and 302s to a 200 with a 404-style-message. 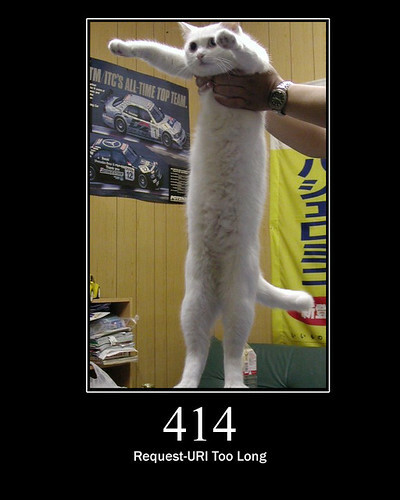 You should check your 404’s 404 response status today. 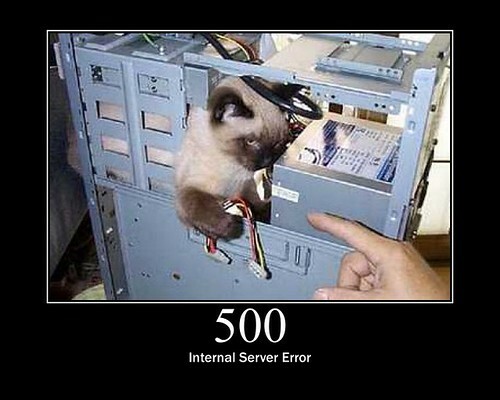 This means that the server encountered an unexpected condition which prevented it from fulfilling the request. Normally this would be an outage. If you see these in your analysis, you probably can’t do much about these, other than to keep your sys admins/hosting company in check. In the real world, if you take your website down for maintenance or updates etc. (if you need to take it down – why not load balance? 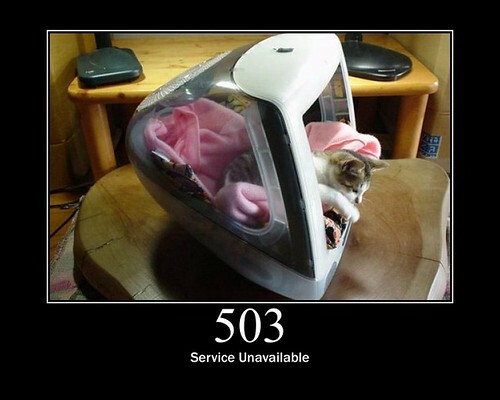 ), you should return a 503. This is effectively a soft 500. This tell the SEBots to come back later. This is important, as if you give a SEBot too many outages, you will lose your rankings! There are more response codes, but in reality, every day, these are the only ones you will normally come across. 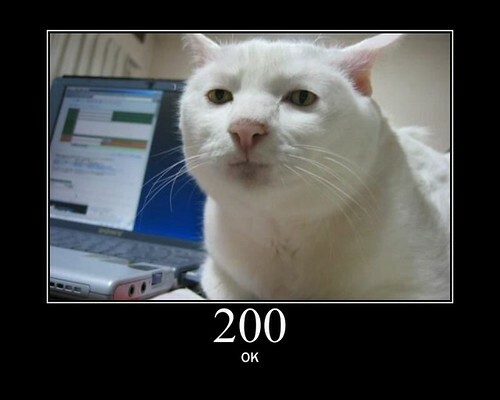 Link to a fun post about response codes shown in pictures of cats. This entry was posted in SEO and tagged 101, How-to, SEO, Techie things on January 7, 2012 by Adrian Land. I am currently seeing more and more, and getting disappointed how another internet service is getting abused. In one of my social media monitoring searches I saw the same user post @Someone for a whole (big) screen full. I looked at the tweets and the profile and there are pretty wet at best. You will see a user with very little value, no followers, following only a few, and only tweets that are a reply / approach to someone. You will get redirected to a site that tries very hard to look official and authoritative and tries to sign up people who can then tweet links to sites to earn money. So, this, what I, IMHO call “tweet spam” is exactly that to recruit people to become tweet spammers. Nice. I guess the next frontier on web spam will be things like this. I guess this kind of activity will take place in person, by phone and online in some medium as long as there are ways to make free money. Its a tide I personally don’t like. This entry was posted in Social Media and tagged General Comment, Pet Hates, Rant, Social Media on January 6, 2012 by Adrian Land.